Today, Monday, January 27, 2014, astronauts are conducting a 6-hour spacewalk at the International Space Station, with hatch opening at 9:10 am EST. If you want to get a sense of what that’s like for the astronauts, the image above is a NASA simulation of a spacewalk in December 2013 to repair a coolant pump. The Space Station — is very big. And aboard her right now are 23 SSEP experiments for Missions 3b and 4. To all those students, teachers, and partners across the SSEP communities, you should take pride in being a very real part of this remarkable adventure, and of your participation in America’s and Canada’s Space Programs. The official NASA Press Release on the spacewalk today is provided below. It was issued last Monday. 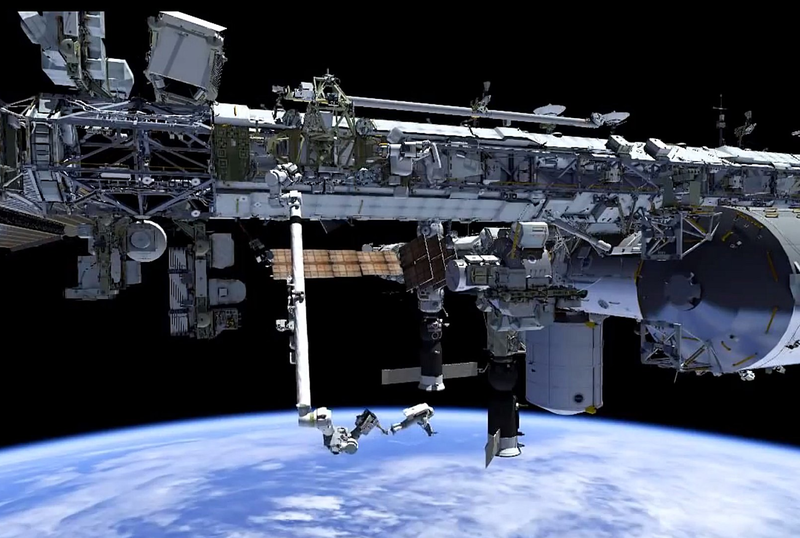 We have provided a NASA TV portal below so you can watch the spacewalk right here at the SSEP website. Expedition 38 Commander Oleg Kotov and Flight Engineer Sergey Ryazanskiy of the Russian Federal Space Agency (Roscosmos) are scheduled to venture outside the space station at 9:10 a.m. in a second attempt to install a pair of cameras on the hull of the station’s Zvezda Service Module. The cameras are part of a Canadian commercial endeavor with Roscosmos designed to downlink Earth observation imagery to Internet-based subscribers. The two cosmonauts also plan to retrieve an experiment package housed on Zvezda’s hull. The spacewalk will be the sixth in Kotov’s career and the third for Ryazanskiy. Kotov will be designated as extravehicular (EV) crew member 1, and Ryazanskiy will be EV2. Both spacewalkers will wear Russian Orlan spacesuits bearing blue stripes.